It is really sad to see that one of the earliest smartphones are no longer in demand. I personally like Blackberry and am still using it but unfortunately the company couldn’t cope up with their competitors like Apple and Android. RIM posted a huge loss for its Q1 2013 fiscal quarter. The company reported a $518 million loss on a revenue of $2.8 billion. The new anticipated Blackberry 10 devices which hoped to bring out the company from loss has also been delayed to next year. RIM has no option but to cut jobs and it is anticipated that a total of 5,000 jobs will be cut in order to save$1 billion in operating costs. Layoffs have already been started. This is one more big blow to the dire state of current economy. To launch their Samsung’s 2 SIM card smartphone – Galaxy Y Duos, they have done something really awesome. You can now map projection on a human face. See the video above, it shows video mapping technique to build several characters on a human face. The images are then projected over an actor as in a canvas. This is being done for the first time if I’m not mistaken on a smartphone and I think this feature is really cool. What do you think? Nokia Lumia is one of the latest attempts by Nokia to make some strong impression in the smartphone industry. To promote the phone they came up with a challenge in a mall where users had to post on Youtube and apparently Nokia Lumia comes out as the winner. I have personally not used Nokia, so users of this phone please share your comments about this claim. Apple’s Siri – Big Threat to Google? Technology keeps changing almost everyday. You buy a new phone today only to know that it’s upgrade would be launched in 3 months. Similarly, the mobile innovation giant Apple has upgraded the iPhone 4 and come up with the most hyped app, Siri which supposedly posses as a big threat to Google. Siri is an intelligent assistant that can help you use computing technology in everyday life in a useful way. It brings together many technologies including natural language processing and semantic analysis. So far the tests and reviews have suggested that the technology works. For people who have switched to Android thinking it has the major market share might be in for a loss with the Apple 4S. Siri is an effort of 5 years of research, 300 researchers and $200 million worth of grant. Apple bought Siri in April 2010 outbidding Google paying a huge price of above $200 million. Siri is fun, exciting and very useful. I would say it is Steve Jobs’ one of the biggest success and innovation in the Apple. Siri has certain issues with Scottish accent but it can understand US, UK and Australian English as well as French and German. If you were to believe Apple, then it is expected to come up with support for Japanese, Chinese, Korean, Italian and Spanish by 2012. Android supporters can say that Google also has Voice search, but it is just an app limited to the search functionality. I’m thinking that Google’s engineers would be working hard now to bring something similar to Siri, but definitely Siri has got the first mover advantage and it would take 2-3 years for its competitor to come. With Siri, I suppose Apple will have an advantage in Smartphones similar to what Google has over MSN in search. Gary Morgenthaler one of the original funders of the project before it was sold to Apple said that the current beta version could be compared to the Wright brothers plane and thats as far he thinks it has to go (see video). We need to wait and see now how far speech recognition can go. There are no third party apps for this at the moment, but I’m hoping this would come out soon as well. Imagine if there were developers writing scripts for enhancing Siri for their websites. The possibilities of making Siri more intelligent would be huge then. We would have Siri in our homes. Just sit on the couch and command the TV to switch on and change channels, no remote, no buttons. People would get more and more lazy and probably the obesity rate would increase further. Google has taken a big stab this time and from what the reports say, they are not taking it in the right spirit as well. One public announcement made by Google said, “your phone should not be your assistant”. People have now and again said negative things about technology which they cannot anticipate. Like the time when Wright brothers came up with flying machine, people said “why would we want to fly” and look at today’s generation. No one wants to walk or drive, everyone wants to fly. Android might have many smartphones and biggest share, but Apple iPhone now has the cutting edge, it has undoubtedly proved itself again as the pioneer of innovation and creativity. Hats off to Steve Jobs and his team! Google’s Android OS that runs on various handsets including HTC, Motorola, Sony and Samsung, is now the most widely used operating systems among the smartphones. It appeared on 43.4% of the new smartphones that were sold in the last three months. Last year it accounted for just 17.2% of the market but this year, out of the 107.7 million smartphones shipped in three months, 46.8 million had Android OS. 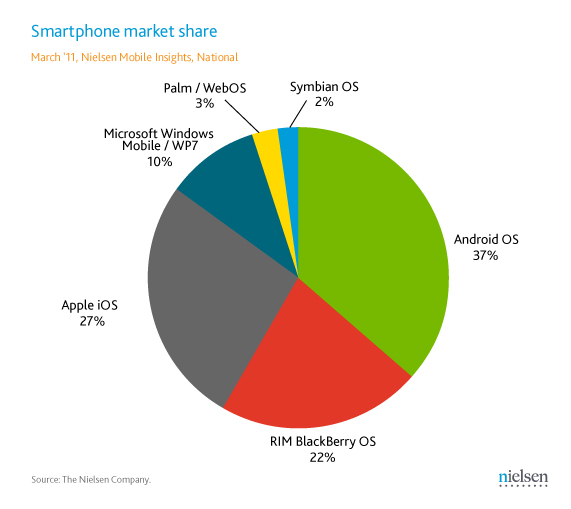 Android is now the leader in mobile OS, overthrowing Nokia’s Symbian, whose market share has almost halved from the same period over an year ago. It now accounts to just 22% of the mobile OS market. 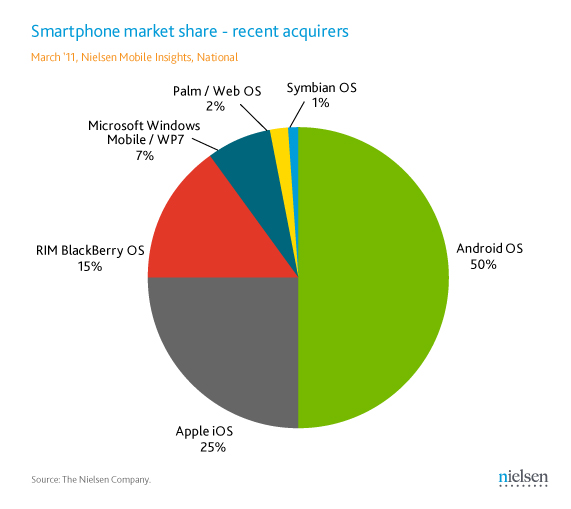 Apple’s iOS is approaching the Nokia’s Symbian with 18.2% market share. Looking into the statistics, Google and Apple are the clear market leaders as their combined market share has almost doubled to 62% as compared to 31% share of last year. Even though this quarter, Nokia has sold the maximum number of handsets, it’s market share has fallen from what it was last year. The second most selling handset is Samsung, followed by LG. Surprisingly, even though Apple announced the launch of iPhone 5, sale of iPhone 4 doubled this quarter to the same period last year. RIM, the manufacturer of Blackberry handsets, saw a decline in their market share by 12%. The company also lost its number 5 position in mobile device vendors to ZTE. Google has now planned to enter full fledged mobile market. It is expected to unveil details about how customers can make payments, redeem coupons, and even get loyalty points by waving smartphone in front of a small reader at a checkout counter. Google plans to show off the technology at an event on Thursday in New York. The technology is called as near field communication, which is embedded in newer smartphones powered by Android OS, and this will convert the devices into a kind of electronic wallet. One of the biggest mobile payment company, Square Inc., offers free hardware to businesses for mobile phone transactions, has introduced this new software aimed at making consumers’ mobile phones a mobile wallet. This program will first launch in New York, then San Francisco, followed by some other locations and eventually a broader rollout. Some of the participating retailers include Macy’s, Americal Eagle and Subway. One of the leading mobile phone manufacturer, Nokia, confirmed that its facility at Sriperumbudur crossed 500-million mark in handset production. This is indeed the fastest production ramp-up that Nokia has seen in any of its ten facilities across the globe. To mark the achievement, Nokia plans to auction the 500th million phone, a Nokia C3-00, personally autographed by its brand ambassador Shahrukh Khan. The money earned by the auction will be given to a charity. Nokia also gifted that model to all its employees as a gesture of appreciation. Prakash Katama, Director, Chennai Factory Operations, said in a press conference that Finland-based company had invested around $285 million to create to expansion facilities in India. Since it was setup in 2006, the facility has grown to become one of the largest phone making unit in the world. He expressed confidence that the company would touch the one billion handset production mark sooner than later. With the market share growing for Nokia day by day, wonder how Nokia plans to sell these 500 million handsets. Smartphone market keeps changing very frequently. According to The Nielsen Company’s monthly surveys of U.S. mobile consumers from July-September 2010, the new smartphone buyers are very clear in their choices – 33% wanted an iPhone, 26% wanted Google Android and 13% wanted RIM Blackberry. But the recent survey for Jan 2011 – March 2011, revealed that things have changed. 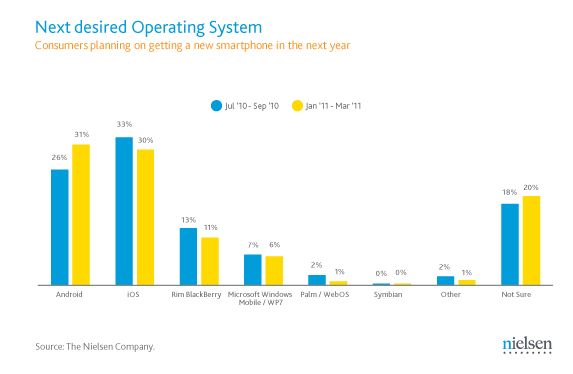 Now 31% want to buy Android phone, 30% want iPhone and only 11% want RIM Blackberry. 20% of consumers have not decided which one to take. The dynamics of smartphone market is already converting to sales. Almost half of those surveyed in March purchased an Android device. 25% said they bought an iPhone and 15% picked Blackberry. Now to talk about the current market share of smartphone users: As of March 2011, 37% of smartphone users have an Android device, 27% have an iPhone, and 22% have Blackberry.